Tribal drums from all over the planet, soaring native flutes, guitars, shamanic atmospheres, spirit rattles and wilderness sounds awaken you to the dance of life. 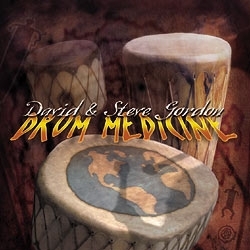 David & Steve Gordon, creators of the #1 best seller, Sacred Earth Drums, take you on their greatly anticipated new musical journey. With their world instruments and studio artistry, the Gordons have the power to entrance and summon the sacred dance. The healing power of the drum moves you... to dance, to dream, to live!